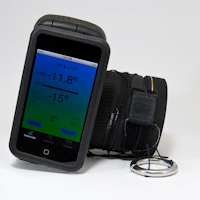 PanoTool turns an iPhone or iPod touch into an inclinometer for taking handheld panoramas with SLR and compact digital cameras. A voice guides you 'up' and 'down' so that your camera is either perfectly horizontal or aiming correctly at the pitch angles you have set. PanoTool was originally developed for making spherical panoramas from just 4 pictures using 8mm fisheye lenses. Its ability to provides guidance for up to 4 different panorama rows makes it possible to make VR, 360° x 180° panoramas with a range of wide angle lenses. It can even been used with 28mm compact cameras though the number of pictures to make a sphere is considerable. With SLR cameras in portrait position the iPhone is held against the flat bottom of the camera. Velcro or a piece of rubber can be used to prevent slipping. PanoTool comes bundled with PanoCalc a field of view based calculator to help you plan the numbers and angles of pictures needed to make panoramas. PanoCalc begins by giving you the field of view of any lens-sensor combination you give it. It then helps you calculate the number of pictures per row and the total area covered for your panorama. It can also provide additional calculations for handling zeniths and nadirs. PanoCalc is also available separately. PanoTool and PanoCalc are compatible with iPhone and iPod touch. Unless indicated otherwise all the panoramas and projections on this website were taken handheld with an 8mm fisheye lens using either PanoTool or a HaPaLa, an earlier system using laserpointers. They can be seen in more detail in my Flickr photostream..
A Canon EOS Digital Rebel with an 8mm fisheye lens the iPod touch holder is velcroed to the bottom of the camera. Above the camera is within 1° of its target which is 30° and the photographer hears an audio confirmation.